Former Florida Gov. Jeb Bush outlined his views on foreign policy in a speech Wednesday, one that was nominally different from his father’s and brother’s but in practice embodies the same hawkish stance that marked their presidential legacies. Substantively, his foreign policy platform could hardly be more similar to his brother’s. George W. Bush’s presidency was marked by aggressive interventionism across the globe, and Jeb Bush’s rhetoric promised more of the same, calling for military support for Ukraine, a tougher stance on Iran, and support for America’s allies against radical Islam. He deplored the current level of military funding, which had fallen to 2.5 percent of GDP, and called on President Obama to “address the shortfalls in our defense spending.” Bush also blasted the president for being too soft on negotiations with Iran over its nuclear energy program, and called on Congress to pass legislation that would trigger sanctions if no agreement is reached. If we withdraw from the defense of liberty elsewhere, the battle eventually comes to us anyway. Bush not only shares the same views as his older brother, he also shares the same foreign policy advisers. Seventeen out of the 21 members of Jeb Bush’s foreign policy team also served under George. W. Bush, including Paul Wolfowitz, one of the architects of the Iraq War. Can Jeb Bush Remain Mr. Clean? The neoconservative drive behind Jeb Bush’s foreign policy views is a known quantity. In 1997 he was one of 25 signatories of the Statement of Principles for the Project for the New American Century, which called for an aggressive foreign policy that used military force to spread American values around the world. Bush briefly discussed several points of his domestic agenda tangential to foreign policy, defending the government’s mass-surveillance program as necessary in preventing terrorism. Could Immigration Cost Jeb Bush the Primary? Jeb Bush is now the front-runner in New Hampshire, but 40 percent of GOP voters say that his stance on immigration is a "deal-breaker" in the primary. 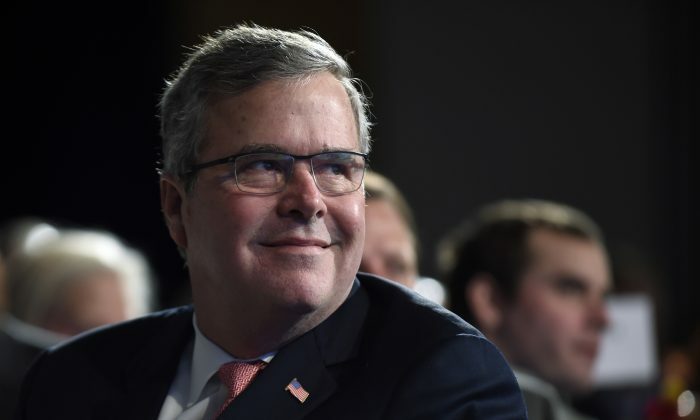 Will Terri Schiavo Haunt Jeb Bush in 2016?